Reviewing can be a frustrating business sometimes: recordings that bode so well on paper but disappoint in reality, or others where fine playing is compromised by the sound quality itself. It’s rarely an entirely joyous experience. But every now and again a recording comes along that makes you want to dance in the street, handing out copies to complete strangers. This is one of those instances, though I will attempt to restrict my enthusiasm to the written word. Following his Beethoven immersion on record, Paul Lewis returns to Schubert, some of whose sonatas he set down a decade or so ago for Harmonia Mundi (3/02, 5/03), a project left tantalisingly in the air. Well, it was worth the wait: in the intervening time he has developed into arguably the finest Schubert interpreter of his generation (as anyone who has heard him live recently will know, not to mention the remarkable disc of duets released in 2010 with Steven Osborne – Hyperion, 12/10). Undoubtedly his immersion in the three song-cycles has left its mark too: the links between Schubert’s Lieder and his instrumental writing are everywhere apparent. The Drei Klavierstücke, D946, that end the set are one of many highlights. Published posthumously some 40 years after Schubert’s death, these extraordinary works are as demanding on the performer as any of the late piano sonatas. Lewis combines a haloed sound with a sense of drama and an unerring instinct for pacing. In passages such as the C minor section of No 2, he combines the intellectual acumen of Alfred Brendel with a still more vivid palette. The shadowy opening of No 3 is a miracle of colouring combined with a sure narrative sense, as involving as if it possessed a text as the music grows in turbulence and menace. Time and again, you marvel at the confidence and sureness of Lewis’s playing, combined with the finesse and musicality that he has always displayed. It’s the kind of playing, in fact, where comparisons cease to matter. But that would be to shirk my reviewerly duty. In the first movement of the D major Sonata, D850, Lewis really brings out the Beethovenian panache of the writing. Few drive through those opening chords with quite as much conviction: neither the less immediately recorded Richard Goode nor Mitsuko Uchida (compelling though they are), although Leif Ove Andsnes is close in this respect. But balancing that is the sheer variety of nuance in Lewis’s quiet playing, not least in the slow movement, with its restrained rhetoric here brought out by a perfectly judged tempo. The finale has that tricky balance of sufficient momentum, humour and also a sense of wonder. Uchida is strikingly dreamy here but less unerring as a travel companion. Brendel, on the other hand, reminds us above all that wit is an essential ingredient in this movement. Schubert of course famously struggled with the sonata, as the many torsos littered along the way attest. But, as so often, particularly when we’re talking Schubert or Bruckner, their unfinished works speak volumes more than the completed opuses of many lesser figures. In the case of the C major Sonata, D840 (dubbed ‘Reliquie’ by an early editor in the mistaken assumption that it was Schubert’s last sonata), he completed two of a projected four movements. In Lewis’s hands the symphonic range of thinking is raptly caught, as is the ambiguity and changeability of mood, together with the twisting shifts of key: how very un-C major this piece is. The late G major Sonata, D894 (written in late 1826, only months after that other extraordinary G major work, the last string quartet) is equally impressive. Less daringly slow in the Andante than Arcadi Volodos (though the Russian, perhaps more than any other pianist of today, has the range of tone colour to back this up), Lewis is particularly impressive in the driving third movement, which contrasts so vividly with the hushed Trio section; it’s playing that is reminiscent of Sviatoslav Richter’s way with Schubert, though without his penchant for sometimes questionable tempi. And Lewis’s wispy ending of the sonata is magical. When it comes to the first set of Impromptus, D899, you’re not going to prise Edwin Fischer’s or Krystian Zimerman’s versions out of my hand, but Lewis’s is absolutely up there with them. The G flat Impromptu is simply ravishing. Oh, and the recording itself is unobtrusively fine too. These performances were recorded live at a Queen Elizabeth Hall recital. Free from the confines of the studio, Cooper rises to the occasion with performances that show a courageous advance on her already distinguished work. This is true, most strikingly, in the great penultimate A major Sonata, D959. The catalogue may be filled to the brim with oustanding discs of this epic work (Schnabel, Kempff, Brendel, Kovacevich, Lupu and Paul Lewis, to name but six) yet few more deeply charged or felt performances now exist on record. Everything is weighted with greater drama and significance than before. Cooper wrings every expressive ounce from the massive opening Allegro and the result is movingly personal rather than overbearing or idiosyncratic. Time and again she makes you sense the dark undertow beneath Schubert’s outward geniality, the pain as well as the fullness of his tragically brief life. Here, the dramatic and poetic parameters are stretched close to the edge, and in the second movement Cooper’s numbingly slow and intense view of Schubert’s Andantino makes you feel as if the protagonist from Winterreise had returned to haunt you with his world-weary despair. Elsewhere nothing is taken for granted and every musical shadow, whether passing or engulfing, is acutely registered, whether in the magical close to Variation 3 in D845, the subtle inflections of a true artist in the following flow of ideas and the fluency and tonal finesse in the windswept finale. Her desire to avoid an undue or cloying romanticism sees her moving swiftly through the con motoof the D major Sonata. Always you sense how the influences of her fellow musicians, of Brendel and Holzmair in particular, have now been subsumed into a vision entirely her own. Finely recorded. In the 1920s and 1930s, Artur Schnabel, and that too little known pianist Eduard Erdmann more or less single-handedly staged a revival of interest in Schubert's late piano sonatas. Alfred Brendel has recalled how Schnabel was perhaps the first pianist to give the A major Sonata, D959 its due, adding: ''Even today, his 1937 recording transmits the freshness of an exhilarating discovery''. Today, of course, we have a lengthening list of fine modern performances—from Brendel himself (Philips,2/89) as well as from such masters as Serkin (CBS, 10/90), Perahia (CBS, 8/88) and Pollini (DG, 4/88). The pioneering 1937 recording none the less retains a good deal of its old freshness and authority despite some occasionally fallible execution. In a way, we are more in need, even now, of a proselytising approach to the D major Sonata, D850. Schnabel's performance is predictably fine in the long slow movement but there are exaggerations elsewhere, not least his mannered way with the rhythms of the Scherzo. By contrast, the Moments musicaux are treated with real intimacy and masterly insight – what, in a slightly different context, SP once called playing that is 'un-charming but touched deeply with tenderness and passion'. As for Schnabel's classic 1939 recording of Schubert's last piano sonata, that in B flat D960, this has long been regarded as one of the Great Recordings of the Century. It is doubtful whether Schnabel ever played better than this on record or whether the interpretation has been surpassed in its comprehensive grasp of the issues that lie at the heart of this music. The recording is generally very good for its day. These excellent transfers were originally made for the two Schnabel Schubert box-sets issued by EMI in 1983–84 (5/83 and 2/84). Schnabel's account of D960 is a necessary acquisition for any representative collection of piano music on record. 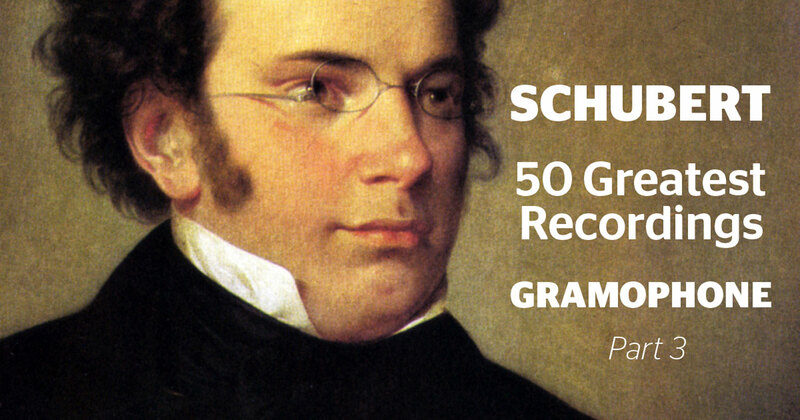 Schubert’s piano sonatas remained uncharted territory for an embarrassingly long time. Rachmaninov did not know of their existence, and their unique character and vision was usually obscured by lazy assumptions and cliches (their lack of conventional form, their ‘heavenly length’, their touching Viennese lightness and lyricism). Since those dark times a wealth of great pianists have come forward to give them their due, led by such pioneering spirits as Schnabel, Edward Erdmann and Kempff. Of these, Kempff holds a unique place and DG’s immaculate reissue of virtually all the sonatas is worth its weight in gold. No other pianist has communicated Schubert with a greater sense of his final transcendence of earthly pain and travail. For Kempff the sonatas are an exploration of ‘the immeasurable depths of Schubert’s soul, offering nothing for the out and out virtuoso and everything for those who find solace in music freed from all material concerns’. These words are revealing and characteristic of a blessedly controversial genius whose play of light and shade and poetic charisma colour every page, whether freely experimental or ideally structured. For some his otherworldliness makes him insufficiently bold or confrontational in, say, the elemental uproar at the heart of the Andantino from the A major Sonata. Again, there are those for whom Kempff’s tempo and manner in the Scherzo from the same sonata are tricky, even salonish, and for whom his understatement at the start of the G major Sonata, D894, or his subduing of the storms in the early A minor Sonata, D537, are unconvincing alternatives to more obviously eloquent and robust performances. He is far less trenchant or speculative than, say, Gilels in the D major Sonata, D850, and yet invariably his range of colour and nuance erase even a lingering sense of Gemutlichkeit, of great music played down to domestic proportions. The first movement of the B flat Sonata is surely among the most subtle and haunting of all Schubert interpretations, the sing-a-song-of-sixpence finale of the D major Sonata a marvel of teasing wit and inwardness. Also, the writer who found the A major Sonata, D664, ‘full of the smiling lights and colours of a spring day’ must surely have heard Kempff play. Even as you long, overall, for a higher degree of drama and intensity, you are simultaneously made aware of a pianist who brought an Apollonian grace to even the fiercest Dionysian pages of Beethoven and who, arguably, found his truest voice in Schubert. Kempff’s tonal sheen and translucence, his magical elixir, remain unique in the history of piano playing. You may feel that Edith Vogel’s claim that ‘Schubert is like Beethoven in heaven’ is a trifle one-sided, but her view is certainly confirmed by Wilhelm Kempff. The cover shows Caspar David Friedrich’s familiar The Wanderer above the Sea of Fog. Pollini, on the other hand, is a wanderer in a transparent ether of crystalline light, and both these legendary performances, recorded in 1973 and beautifully remastered, are of a transcendental vision and integrity. In the Schubert his magisterial, resolutely un‑virtuoso approach allows everything its time and place. Listen to his flawlessly graded ppp approach to the central Adagio, to his rock-steady octaves at 5’23” (where Schubert’s merciless demand is so often the cause of confusion) or to the way the decorations in the Adagio are spun off with such rare finesse, and you may well wonder when you’ve heard playing of such an unadorned, unalloyed glory. Pollini’s Schumann is no less memorable. Doubting Thomases on the alert for alternating touches of imperiousness and sobriety will be disappointed, for, again, Pollini’s poise is unfaltering. The opening Moderato is sempre energico indeed, its central Etwas langsamer so sensitively and precisely gauged that all possible criticism is silenced. The coda of the central march (that locus classicus of the wrong note) is immaculate and in what someone once called the finale’s ‘shifting sunset vapour’ Pollini takes us gently but firmly to the shores of Elysium. Here is a disc that should grace every musician’s shelf. This is something very special. Pires’s characteristic impassioned absorption in all she plays – that concentration which makes the listener appear to be eavesdropping on secrets shared between friends – could hardly find a truer soulmate than Schubert. Each Impromptu has a rare sense of in-teg-rity and entirety, born of acute observation and long-pondered responses. Pires’s instinct for tempo and pacing brings a sense of constant restraint, a true molto moderato to the Allegro of the C minor work from D899, created by a fusion of right-hand tenuto here with momentary left-hand rubato there. Then there’s the clarity of contour within the most subtly graded undertones of the G flat major of D899 which recreates it as a seemingly endless song. Or an Andante just slow, just nonchalant enough for the Rosamunde theme of the D935 B flat major to give each variation space and breath enough to sing out its own sharply defined character. The Allegretto, D915, acts as a Pause between the two discs, a resting place, as it were, for reflection and inner assessment on this long journey. Its end – which could as well be its beginning – is in the Drei Klavierstücke, D946, of 1828. The first draws back from the fiery impetuousness within the Allegro assai’s tautly controlled rhythms to an inner world with its own time scale; the second, more transpired than played, has an almost unbearable poign-ancy of simplicity. The paradox of these unself-regarding performances is how unmistakably they speak and sing out Pires and her unique musicianship. To draw comparisons here would be not so much odious as to miss the point. French pianist David Fray, 28 years old at the time of this disc and already acclaimed for an intensive and dazzling career, offers a Schubert disc of the rarest distinction. Indeed, it is no exaggeration to say that few pianists have been more acutely sensitive to Schubert’s complex inner world, one where an often pained and world-weary quality is thinly disguised by outward geniality. Crystalline and precise in every detail, Fray leaves an unforgettable impression in the six Moments musicaux. Time and again you are made conscious of music where every note is worth its weight in gold. In the four Impromptus, D899, a similar quality of introspection and concentrated vitality obtains. Such artistry even rivals that of Radu Lupu, a pianist once aptly described as ‘a lyricist in a thousand’. The sound is immaculate. Long the Cinderella work of Schubert’s miraculous final year, the E flat Mass is now acknowledged as a powerful masterpiece that mingles liturgical grandeur with the composer’s own subjective Romanticism. The apocalyptic Sanctus, with its daring harmonic shifts and heaven-storming crescendos, is a musical counterpart to Turner’s molten canvases, while the Agnus Dei has a violent, contorted anguish unmatched in a setting of this text. The least personal, and most problematic, sections of the Mass are the monumental set-piece fugues at the end of the Gloria and Credo, where Schubert ostentatiously displays his contrapuntal credentials, probably with an eye on an official church appointment. Hickox chooses broad tempi, balancing dignity and vitality, and building thrillingly to the climaxes. In the Kyrie, at a mobile tempo, he combines gravitas with a Schubertian lyrical ease. You hear how this heavenly music should sound, with the three soloists (Mark Padmore, James Gilchrist – an ideally matched tenor pairing – and soprano Susan Gritton) singing with pure tone and wondering tenderness. Hickox scores over most rivals with his extra choral firepower at climaxes and the wonderfully pungent sonorities of Collegium Musicum 90, whether in the dry, fearful rattle of period timpani in the Credo, the lovely ‘woody’ oboe and clarinet in the ‘Et incarnatus est’ or the steely, scything trumpets in the Agnus Dei. Most of the part-songs here evoke some aspect of night, whether benevolent, romantic, transfigured or sinister. Between them they give a fair conspectus of Schubert’s achievement in the part-song genre, ranging from the mellifluous, Biedermeier Die Nacht, forerunner of many a Victorian glee, and the gently sensuous Gondel-fahrer to the eerie, harmonically visionary Grab und Mondand the brooding Gesang der Geister über den Wassern. Other highlights here include the alfresco Nachtgesang, with its quartet of echoing horns, Ständchen, a delicious nocturnal serenade, the austere, bardic Scott setting Coronach and the serenely luminous Nachthelle. The RIAS Chamber Choir confirms its credentials as one of Europe’s finest, most virtuoso ensembles. It sings with rounded, homogeneous tone, well-nigh perfect intonation and an excitingly wide dynamic range. Characterisation tends to be very vivid, whether in the ecstatic central climax in Nachthelle, sharp contrasts in Gesang der Geister über den Wassern or the great sense of awe – and palpable feeling for Schubert’s strange modulations – in Grab und Mond. Birgit Remmert, the alto soloist in Ständchen (sung, incidentally, in the version with women’s voices), sings well enough but with insufficient lightness and sense of fun. But Werner Güra negotiates what one of Schubert’s friends called ‘the damnably high’ tenor solo in Nachthelle gracefully and with no sense of strain. Philip Mayers is a serviceable rather than specially imaginative pianist, though the delicate, silvery treble of the early 19th-century instrument is enchantingly heard in Psalm 23. The recorded sound is clear and warm, with a well-judged vocal-instrumental balance. Just a couple of months ago, Richard Fairman welcomed Benjamin Appl’s first fully fledged recital disc, a collection of Heine settings on Champs Hill Records, and hailed the young German baritone as ‘the current front-runner in the generation of Lieder singers’. This Wigmore Hall recital serves emphatically to underline that point, and, with Graham Johnson as a supportive and inspiring partner at the piano, it sees Appl in even more natural-sounding and impressive form. His instinctive feel for these songs is immediately striking and manifests itself in the sort of artlessness that distinguishes the finest Lieder singers: a lack of tension, an easy relationship with the poetry, a confidence in the words and Schubert’s melodies to communicate with nothing but the gentlest helping interpretative hand. The voice, which occasionally felt pushed and ‘manufactured’ on the earlier disc, is here a great deal more relaxed. Appl’s is a light, honey-coloured baritone with a welcome hint of woodiness, and he deploys it with great sensitivity, not least in an expressive trick – favoured by Christian Gerhaher – of being able to withhold and gently apply vibrato at will. Occasionally one fears for the voice’s general robustness, and he starts to sound a little tired in ‘An den Tod’, but at its best it’s a wonderfully expressive and seductive instrument. What distinguishes this recital, however, is the interpretations themselves, bringing freshness to familiar numbers and making a persuasive case for those that are heard less often. We start with a touchingly tender and chaste account of ‘Der Bach im Frühling’, after which Johnson’s accompaniment to ‘Der Wanderer an den Mond’ is a marvel of peacock-like prancing. The pianist gives a delicious bounce to ‘Fischerweise’ and has an unexpected, almost spiky way with the introduction to ‘Gruppe aus dem Tartarus’. Throughout there’s a pleasing sense of contrast between the Johnson’s sharply drawn contributions and Appl’s serene vocalism and gentle musicality (listen to the way he colours the phrase ‘Schwester Seele’ in ‘Verklärung’, around 1'20", for an example). Other highlights include a genuinely unnerving ‘Der Zwerg’ at the centre of the programme (one of few numbers followed by applause), and a delightful ‘Die Taubenpost’ to close – a disarming conclusion to an outstanding recital, and a beautifully recorded one too.